though I didn’t tell him at the time that the further I got into the book I was reading, the more questions I had about walking. That book is Born to Run by Christopher McDougall*, the book that was the basis of the New York Times Magazine article “The Once and Future Way to Run” that I referred to in my earlier blog post and had mentioned to my family a few days earlier. So with this post, I have now finished reading the book that has provided some amazing insights about running (walking). tango and life. But first, I’d like to try to clean up my last post a bit with some specifics about what it has meant for me and tango social dancing. Keep your feet underneath you. Step with you knee, not your feet. (2) It’s been difficult for me to change my posture, but some of the changes I’ve made have reaped dividends. I spent way too many years flexing at bit at my waist (tilting forward from the waist) — because I thought that was the right thing to do. And the harder I tried to fix my posture, the more aches and pains I got in my lower back and below. Now, I’m starting to learning how wrong I was and what I need to do differently to fix posture, although I still have a long ways to go. Most of the aches and pains in my lower back have disappeared (and I was able to ski again this winter) without any adverse effects. 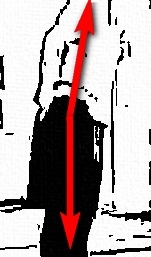 Illustration2: Showing bad posture bending or tilting forward from the waist; note the bend in the middle of the "red line ". Illustration1: Showing good posture, with the shoulder, hip and foot aligned, see the straight "yellow line". Finally, it’s been helpful for me to get my head around the concept of “keeping my feet underneath me” and “tilting forward from the ankles” with the heel down and the feet flat on the floor. While these concepts can work independently, they can also work together as shown by Illustration 3. Illustration 3: Tilting or leaning forward from the ankles with feet flat on the floor. The yellow lines show an example of good posture. 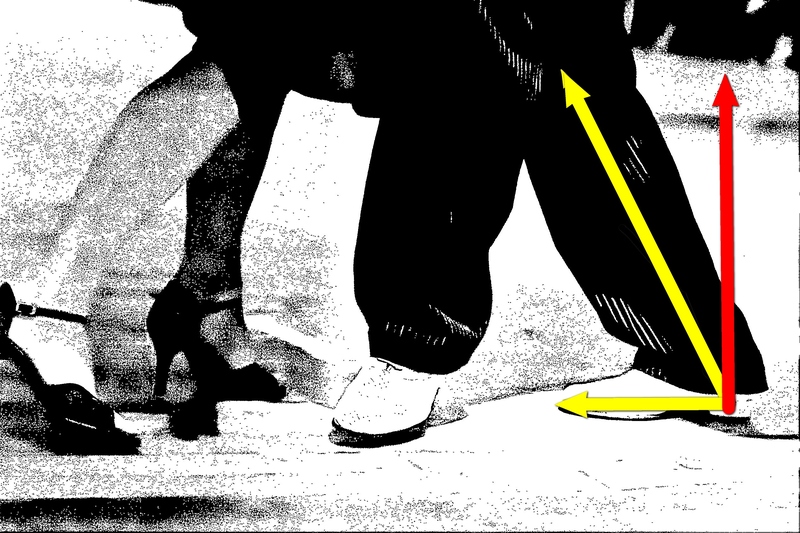 The red line shows a wrong posture when the legs are perpendicular to the floor. It’s been an interesting for me to discover how some of these diverse pieces seem to fit together. A number of people from different walks of life had to tell me essentially the same thing in their own way before I had my “Eureka moment.” But as all tango dancers eventually discover, a Eureka moment is just the beginning of a quest and not the end. I’ll share more from the book later on, as they give me new insight into tango dancing. As the book subtitle says, “A hidden tribe, superathletes, and the greatest race the world has never scene.” That’s not unlike the path taken by most aspiring milongueros in their own personal quest. The book is worth the read for anyone. It is a fascinating read for those who would like to understand their dance. *Thanks to Mike Adamle for encouraging me read the book! we have translated your article to Turkish and shared it in our facebook group page..